Union Hotel | Historic Jacksonville, Inc. 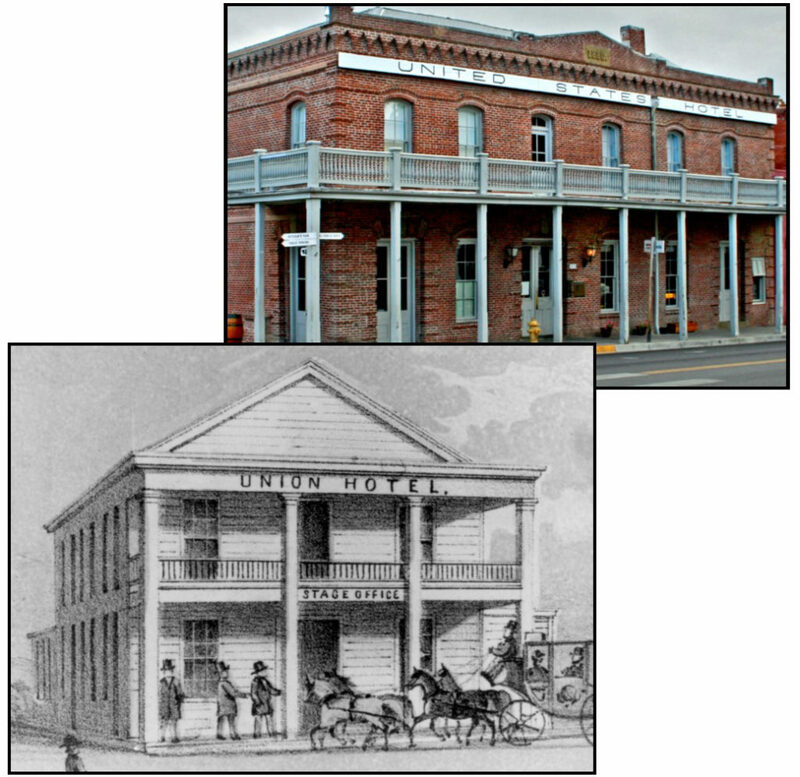 The southeast corner of Oregon and California streets has been the site of a hotel almost since Jacksonville was founded. As early as November 1852, Jesse Robinson claimed “squatters rights” to an existing 2-story wood frame structure. The “Robinson House” became a “private boarding house patronized by the elite.” Austin Badger and Nelson Smith purchased the building in late 1855, renamed it the Union Hotel, and enlarged it. When Badger and Nelson couldn’t pay their debts, the Union Hotel was sold to Louis Horne who rechristened it the U.S. Hotel. Horne “improved” the hotel in 1868 by adding a 50’ x 30’ hall fronting on E. California. The 2nd floor, resting on “steel springs,” was made expressly for dancing; the ground floor housed offices and shops. Three years later a skating rink was opened in “Horne’s Hall.” The disastrous 1873 fire which leveled many of the wood frame structures on California Street was believed to have originated in a flue of the U.S. Hotel. The fire destroyed everything on the block…except for Horne’s chicken coop. The property was subsequently sold at a sheriff’s sale and then resold to brick mason George Holt, and his wife, hotel proprietress Jeanne DeRoboam Holt. George fired the bricks for his wife’s long dreamed-of, brick hotel. The brick U.S. Hotel, the structure we know today, opened in 1880 with a Tammany Day celebration, a Fourth of July Ball, and a visit by President Rutherford B. Hayes.